Mountain Resort is situated in the mountains within surroundings of beautiful pastured areas, 1km from the village of Anogia, Rethymnon. It is at an altitude of 900 meters on the road that leads to “Nida”. 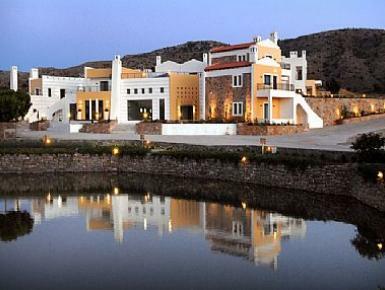 This resort, with its multiple activities, was created on a stretch of land which totals approximately 30.000 m2. In harmony with the original Cretan tradition and the beauty of wild nature of the area, which hosts a superb hotel with all the comforts of a four star, which it is rated. It is considered the largest mountain resort of its kind on the island of Crete, and beyond this, one of the largest in Greece. 13 spacious rooms, with their luxurious décor, provide the visitor with a quality stay. All rooms have a fireplace, hydro massage and a balcony or veranda with a view of snow covered Mount Psiloritis, which is the highest mountain on the island of Crete. The hotel, also, offers to each guest a fabulous beauty and relaxation salon. This inviting area consists of a heated swimming pool with hydro massage, sauna, hamam, facials, manicure, pedicure and body massage and therapies.